Emerald Waterways' new Emerald Liberte made its debut in France this year. 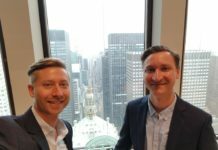 New York City and Los Angeles were the venues chosen for the 15th annual meetings of the Visit Europe Media Exchange (Vemex). Dozens of European exhibitors journeyed across the pond to help promote what’s new for 2018 in their countries, regions, cities, attractions and services. While there wasn’t time to meet with everyone, let me share many upcoming tidbits of interest in planning client travel to Europe in the months to come. Czech Tourism is planning a big year of special happenings to commemorate the 100th anniversary of the establishment of the Czech Republic as the independent Czechoslovakia state in 1918. Czech Tourism will promote the following topics: The Golden-Age of Modernism: stories about independent Czechoslovakia architecture and design; Lifestyle: famous cafes, spas and the story of Czech beer; Czech Originality: stories of Czech brand names such as the Skoda and Tatra auto companies, Bata footwear, and traditional products such as glass and fashion jewelry. All regions and municipalities are onboard for this centenary celebration. For example, Brno—2 hours by car from Prague—has a calendar full of special events, including the two-week (Nov. 22-Dec. 8) Janacek Brno 2018 6th International Opera and Music Festival. Taking place in the newly renovated Janacek Theater, the festival honors the renowned composer Leos Janacek. For more information, visit czechtourism.com. In 2018, German Tourism will be spotlighting Culinary Germany & Michelin-starred restaurants. Certainly the time is ripe as the gourmet scene in Germany has rarely ever been so dynamic, says a tourism spokesperson who pointed out that over the last few years more and more talented newcomers have joined the ranks of top chefs, and at the moment, more than 290 restaurants in Germany offer Michelin-starred cuisine. For example, southwest Germany—Baden-Wurttemberg—is home not only to Heidelberg, the Black Forest, and 60 well-preserved castles, but to 84 Michelin stars—the highest density in all of Europe. 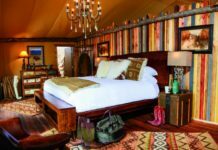 For next year, it is preparing a feast of food and travel activities, including tastings at both the gourmet and local level of culinary specialties, as well as wine tastings in two regions and craft beer breweries. A special event focuses on the Baden Asparagus Trail celebrating its 350 years of green roots importance; the trail runs approximately 85 miles long with both palaces and asparagus farms (Rastatt farm is the largest in Germany), as well as scenic Black Forest terrain. And Germany is already far along in planning countrywide/worldwide events celebrating the 100th anniversary of the Bauhaus, the school of design that would become the symbol of modernism in Germany. En route to the centenary, three big exhibitions are already on display at Bauhaus institutions in Weimar, Dessau and Berlin. Glasgow is celebrating the 100th anniversary of the birth of its famous Glasgow-born architect Charles Rennie Mackintosh with year-round events, while in Dundee, the Victoria and Albert will open an outpost of one of the world’s best museums. In Northern England, clients adventuring in the Lake District, will share the UK’s only national park’s latest accolade: named a UNESCO World Heritage site in July 2017, while the city of Liverpool celebrates its 10th anniversary of serving as the European Capital of Culture with the Terracotta Warriors’ return to the World Museum in February, and the Liverpool Biennial taking place July through October to showcase contemporary art across the city. Cornwall and Devon are calling all foodies to celebrate a return to local, organic produce. There are seafood festivals from Dorset to Salcombe, tours of Brixham’s famous Fish Market and the Tavistock Farmers’ Market, as well as foraging expeditions for seafood, herbs and mushrooms. England’s Wine Region embraces nearly 400 commercial vineyards. Consider those in super scenic High Weald, including Chapel Down, Biddenden (oldest in the region), and Denbies (one of the largest wine estates).For more information, visit visitbritain.org. Titanic Belfast was voted the ‘World’s Leading Tourist Attraction’ for 2017, and “it’ll be even better in 2018;” Screen tours—Ireland a star on the rise in “Star Wars” film locations. From “Star Wars: The Force Awakens” filmed in the West to “Game of Thrones“ in Northern Ireland. Guests can also enjoy a kaleidoscope of culture—contemporary arts, drama, music and heritage—at the Dublin Festival next autumn. And here’s a heads up for booking the luxury hotel Adare Manor, which just reopened following a ground-breaking transformation. For more information, visit Ireland.com. Palermo will be Italy’s Capital of Culture for 2018, a fascinating decision based on honoring the Sicilian capital’s use of billions of euros seized in goods and properties from the Mafia bosses to fund city regeneration. Under the leadership of Leoluca Orlando, mayor of Palermo for the last 17 years, more than 60 percent of the city’s historic buildings have been renovated, and Palermo is getting greener with newly installed electric trams and a metro connecting the city center to the outskirts. La Cala, the yacht harbor and marina, has won prizes for its regeneration, and clients may enjoy taking the Anti-Mafia Tour, organized by Adddiopizzo, the anti-racket association that takes visitors to places that symbolize the war against the Sicilian godfathers. Check out Palermo for 2018. 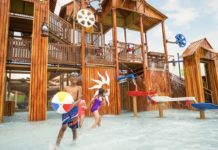 For more information, visit italiantourism.com. 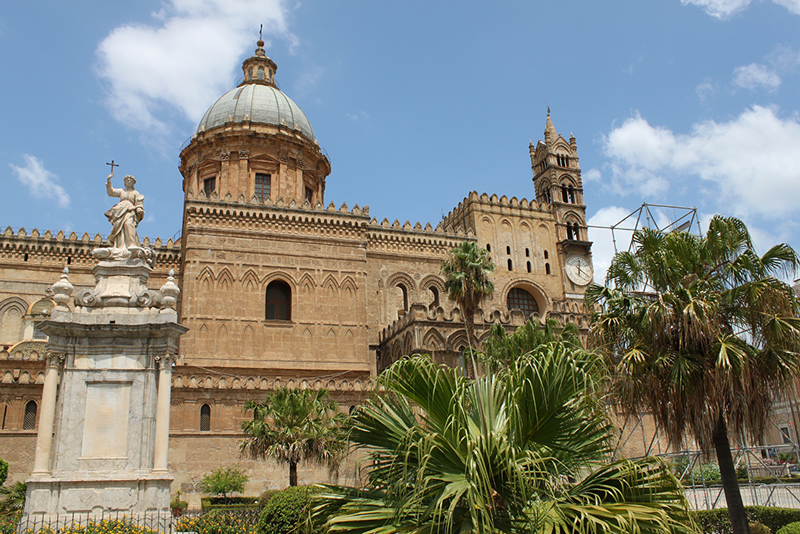 The cathedral of Palermo is a site to see while in Sicily. Amsterdam hosts stunning exhibitions in its more than 50 museums. Right now and until the end of May 2018, be sure to plan a visit to the Dutch Masters Exhibition at the Amsterdam Hermitage, closely associated with the Hermitage Museum in St. Petersburg. Famous also for its flowers, the Keukenhof is considered the most beautiful spring garden in the world; its gates open on March 22, 2018, for the 69th time, closing eight weeks later. This year’s theme, Romance of Flowers, will be carried out on April 21 in the unique Flower Parade—a floral extravaganza of 20 floats and 30 luxury cars. Amsterdam Marketing is putting the accent on its neighborhoods away from the center. For example, renovated and hip is Amsterdam North, the area to discover urban beaches, restaurants, the EYE Film Museum, art galleries, and a new concert hall. Access is via a free ferry, rail from the Central Station, or a new metro line in service by July 2018. For more information, visit iamsterdam.com. Art-loving clients may head to Basel for the giant “Art Basel,” which will bring together the world’s leading galleries to showcase the works of some 4,000 modern arts, on June 14-17, 2018. Make a note that the new boutique Hotel Krafft Basel was awarded Europe’s best “Historic Hotel of the Year 2017.” Located in the lively Old Town and on the Rhine River, guests enjoy rooms with free WiFi and complementary bikes for touring Basel. From gateway Geneva, plan for day trips to a chocolate factory or to the charming cheese-famous village of Gruyeres, and certainly to the canton of Vaud. Coming in 2018 is the Fete des Vignerons, a spectacular, centuries-old Wine Growers Festival, held once every generation; reserve ahead for July 18-Aug. 11. Geneva is also the gateway to celebrity-studded Gstaad, among the top Nordic ski resorts in the Alps and home to the 56-room Alpina Gstaad, the first luxury hotel to debut here in 100 years. For more information, visit myswitzerland.com. Looking ahead to 2018, CroisiEurope will debut its new MS Elbe Princesse II, sister ship of the Elbe Princesse, this February, adding its third paddlewheel ship to the fleet. At the same time, two existing ships—the MS Van Gogh and the MS Renoir—will undergo a complete rebuild and transformation to become the latest 5-anchor ships to join the fleet. Also next year, the cruise line will add new destinations within Europe, including Corsica, the French Riviera and new itineraries on the Rhine and Rhone Rivers, while also debuting new long-term cruise offerings: 18- and 29-day itineraries. 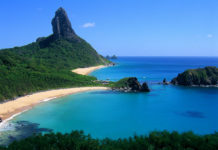 For more information, visit croisieuroperivercruises.com. Emerald Waterways has just celebrated the christening of Emerald Liberte—the third in a trio of new Star Ships—making its debut in France. 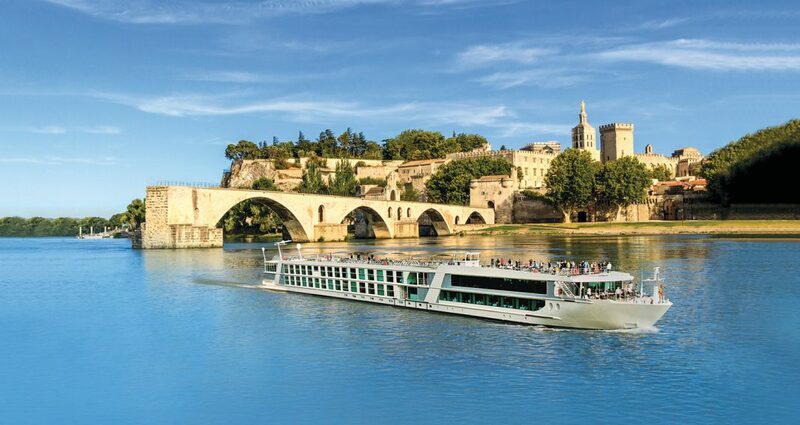 The boutique ship carries a capacity of 138 guests and will cruise between April and October on the Rhone and Saone Rivers on 8-night itineraries from either Lyon or Arles. Sailings are priced from $2,995 pp dbl. Other members of the river cruise company’s trio include the Emerald Radiance, launched in June in Porto, Portugal, and the Emerald Destiny, christened in Vienna in May.For more information, visit emeraldwaterways.com. This year, Eurail added Eurostar, the high-speed passenger service that links the UK with mainland Europe, to its membership group, permitting Eurail Pass holders special fares and greater availability of seats. Further, Eurail launched the new Italy-Switzerland Pass and improved its youth fare offer by increasing the age cap from under 26 years to under 28 years. For more information, visit eurail.com/en. Luxury Scotland welcomes the Lews Castle, located on the remote Isle of Lewis in the Outer Hebrides, into its hotel portfolio. This historic castle, dating to the mid-10th century, features 23 guestrooms in a flexible configuration of individual suites that offer guests a variety of accommodations and self-catering options. On arrival guests receive a complimentary welcome basket with local essentials to enjoy on the first evening and breakfast the next morning; guests can also pre-order a range of groceries and a sumptuous dine-in menu. At other times, there are fine restaurants in close proximity. Lews Castle is also popular for weddings, and a special castle feature is its own museum. Lews Castle is one of the latest additions to the Luxury Scotland hotel portfolio. Another Luxury Scotland member, the Belmond Royal Scotsman, has just launched Europe’s first spa car: the Bamford Haybarn Spa carriage, offering train passengers crafted spa treatments devoted to connecting the mind, body and soul with the natural landscape. For more information, visit luxuryscotland.co.uk.